This year is an exciting one for films! Disney has a lot in store with films being released from March through December. We have both animation and live action specialties so let’s take a look at what is to come. Similar to what we have seen in the 1939 classic The Wizard of Oz, we go from Kansas to the brilliant world of Oz. However, instead of focusing on Dorothy, this film concentrates on the life of Oz played by James Franco. The three witches are Theodora (Mila Kunis), Evanora (Rachel Weisz) and Glinda (Michelle Williams). This film will be a mystery on who is good and who is evil, as well as figuring out whether Oz is as great a wizard as he leads others to believe. Sam Raimi directs with a score by Danny Elfman. I’ve spoken to many people who have mixed opinions on this concept. Most are lovers of The Wizard of Oz, so they believe that the storyline should be left alone. They feel a Tim Burton’s Alice in Wonderland vibe going on during the previews. However, I feel that Raimi could do a wonderful job with this if he played his cards right. Airing on the Disney Channel, this film comes from the Wizards of Waverly Place TV show on the same channel. Most of the original cast will be in the film including Selena Gomez who plays Alex. This will focus on a trip to Italy where the family will meet long lost relatives. We see a battle between a good Alex and a bad Alex created from a spell. Honestly, I do not watch Wizards of Waverly Place so the excitement level is not high for this one. I’m sure it will be a fun, campy film though. All hail the return of Tony Stark! Marvel will bring us yet another action packed superhero film…no complaints here. The richly talented actor Ben Kingsley will give us the portrayal of the villain named The Mandarin. Paul Bettany returns as the voice of Jarvis, as well as Gwyneth Paltrow as Pepper. We will also see Don Cheadle as James Rhodes/War Machine. Shane Black will direct this one. Words cannot describe how unbelievably excited I am for this one. After being rather disappointed with the second one, I’m hoping this one will blow it right out of the water. The cast is incredible; hoping the film is as well. A prequel to Monsters, Inc., this will concentrate on the lives of Mike and Sulley attending the University of Fear in order to become full-fledged monsters. We will see Randall as well as the Abominable Snowman in this. Billy Crystal, John Goodman, and Steve Buscemi return for their original voice roles. 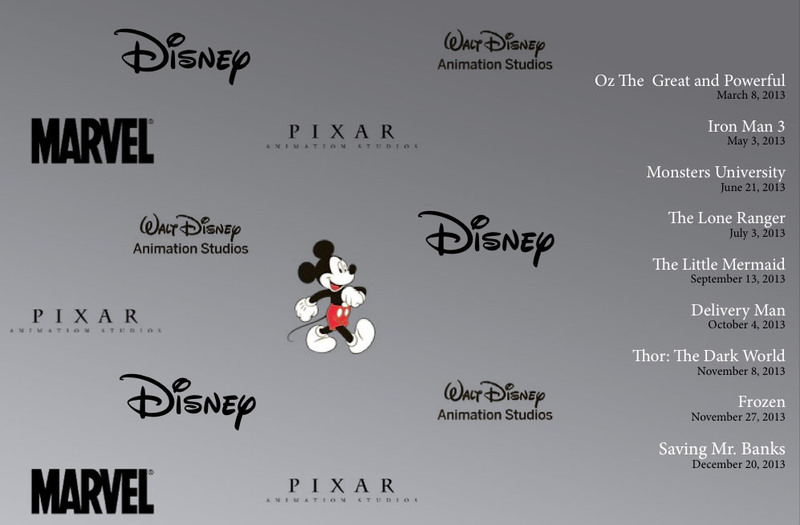 We will also hear Helen Mirren, David Spade, and Michael McKean among others providing characters’ voices. Dan Scanlon will direct. Being a big fan of Monsters, Inc. and knowing how many people adore it, I have a good feeling about this. After getting past the fact that Boo will most likely not appear in the film, I have accepted that this will be a solid production. Most definitely looking forward to it, as the original gave us a beautifully animated creation. This short will likely appear prior to Monsters University. It will focus on the beauty of inanimate objects – umbrellas. Two fall in love and a story will unravel. We do not have much information on this at the moment but it is almost better to not know and just let it be a surprise. 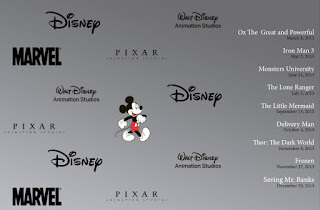 This looks like it will be quite an outstanding piece and might even give some competition for Paperman. I always look forward to the shorts preceding a Disney/Pixar film. They are continually amazing and give us a peek into the animators’ minds each year. Armie Hammer will star as John Reid/The Lone Ranger and Johnny Depp will star as Tonto in this recreation of the classic 1949-1957 television show. Helena Bonham Carter will play Red and the fabulous Tom Wilkinson will give us Latham Cole. Directed by Gore Verbinski, this focuses on the life of Reid and how he became a fictional but historical role model for many. This looks to be an exciting film and I am definitely looking forward to seeing it. The excitement level for me probably places this film in third place for me, with Iron Man 3 being in first. Also, with Johnny Depp, you really cannot go wrong. Similar to The Wizards Return: Alex vs. Alex, this film will be a Disney Channel movie. This is about a young surfer girl whose parents send her to boarding school. From here, she somehow finds herself in a 1960s beach musical where people will suddenly break into song. For some reason, I’m imagining a mix of Pleasantville and Beach Blanket Bingo. Hopefully I will be wrong but I can see it having the same charm factor as Prom. That is, if you are like me and actually thought a charm factor existed within Prom. This film will concentrate on a plane named Dusty whose wish is to compete in an aerial race. His friends will assist in helping him overcome his fear of heights. This is said to be a spinoff of Cars; however, Pixar will not be involved in this production. Despite this fact, John Lasseter will oversee the making of the film. I’m not sure how well this will do in theatres knowing that this is a spinoff of Cars. Hopefully having planes in place will be endearing as well. The concept sounds cute. Marvel is preparing to give us another superhero film, this one focusing on the mythical god Thor. Thankfully, the majority of the cast is returning except for Once Upon a Time’s Josh Dallas as Fandral. Zachary Levi will step in to take his place. Alan Taylor will direct; this appears to be his first involvement with Disney and Marvel. Christopher Eccleston will play the villain Malekith as a battle wages between Thor and the Dark Elves. This film rates in second place for me. I’m a Marvel loving gal so I have high hopes for their 2013 films. Kristen Bell and Josh Gad will voice Anna and Olaf in this animated film about a mountain climber on the quest to find the Snow Queen. Hans Christian Andersen wrote the original tale appropriately titled The Snow Queen. This looks to be a mythical story, one which looks to contain unsurprisingly beautiful animation. I have not heard a great deal about this film but it appears to be interesting. To me, the pictures I have seen resemble a mix of Mulan and The Secret World of Arrietty. Tom Hanks will portray Walt Disney in this film about PL Travers (played by Emma Thompson), the author of Mary Poppins. This takes place before the film was actually released to the public. We are told that part of this was filmed in Disneyland, which should be neat to see. We will see a tremendous cast including the likes of Paul Giamatti, Rachel Griffiths, Bradley Whitford, Colin Farrell, and Jason Schwartman among others. This looks like it will be an interesting one to see. I am looking forward to seeing Hanks portray our Uncle Walt, as well as seeing Thompson portray Travers. Some of us may be briefly familiar with their real life business relationship which was definitely not an easy one. I am extremely excited about the upcoming year of films. Each one looks solid in its own way. Despite looking forward to the Marvel centered films most of all, each look like masterpieces which are sure to make 2013 quite a special year. It’s like no place I’ve ever seen. When will there be a trailer to "Frozen"? I'm still concern that the film is going to be out in 9 months and we still haven't seen final animation or stills for the film yet. We're probably about 2 months out from one. There have been stills already though you can definitely find them. Just search for "frozen disney" on google and use images. I'd be more worried than they just signed on Dane Cook as the voice of Dusty in Planes and its out in 5 months - he's re-voicing an already voiced work.